Mineralsthat can only be formed in the presence of liquid water have again beendetected on Mars, this time in huge craters in the low-lying terrain of the redplanet's northern hemisphere. The newsurvey found the so-called hydrated minerals in nine giant craters dotting thenorthern plains of Mars. The minerals appear to have been formed by liquidwater more than 3 billion years ago, suggesting that past wateron Mars altered the planet's surface much more significantly than researcherspreviously thought. "Thesouthern hemisphere of Mars is ancient ? over 4 billion years old," leadresearcher John Carter, of the Centre National de Recherche Scientifique inOrsay, France, told SPACE.com. "It's highly cratered with lots ofgeological structures, and there are quite a few sites where we have thesehydrated minerals. So, we already knew that there was likely liquid water on ornear the surface of early Mars." But, lesswas known about the mineralogy of the planet's northern hemisphere. "Thereis a huge dichotomy between the northern and southern hemispheresof Mars," Carter said. "The northern hemisphere has verylow-lying plains that are poorly cratered and very young ? less than 3 billionyears old. They're very different in morphology and composition to the crateredsouthern highlands." This latest discoverycomes after the recent announcements that a vast ocean on Mars existed in theplanet's ancient past and that liquid water from melting glaciers appears tohave carved channels as recently as several hundred million years ago, morerecently than previously thought. Carter and agroup of French and American researchers analyzed data from NASA's MarsReconnaissance Orbiter in order to probe the northern lowlands, which actuallycover one-third of the planet. 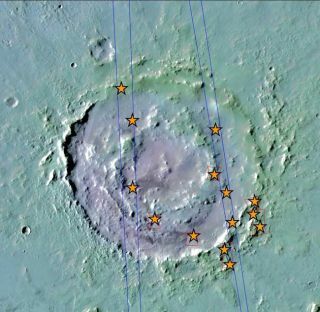 The researchersexamined large Martian craters, on average ranging from about 10miles (16 km) to 37 miles (60 km) in diameter. They also investigated onecrater, the largest in the northern plains, that was130 miles (210 km) wide. The regionwas thought to have been resurfaced by lava flow approximately 3 billion yearsago, and scientists were unsure whether hydrated minerals had been preserved inthe crust. Additionally, deposits of dust and ice ? part of the process called mantlingin which Martian lava, dust and ice reshape the planet's surface ? have alteredthe terrain in the northern lowlands. So, whilemost of the large-sized craters share similar structure and features, themantling process prevented some sites from delivering usable data. As a resultof such mantling, Carter and his colleagues had to contend with a smallersample size. Theresearchers detected water-bearing minerals in nine craters. These mineralswere likely buried by intense lava flow, and eventually excavated by subsequentmeteor impacts that transformed the resurfaced northern region of the planet. "Althoughwe don't have as many sites in the north, we do see most of the variety of theminerals found in the south," Carter said. "This is an indicationthat Marshad liquid water on the surface, or near the surface, not only in thesouth, but in the north as well. It was not just localized in areas in thesouth, it was everywhere." But, Carteris quick to clarify that these findings do not imply that Mars once had flowingoceans on its surface. In fact, while it does provide further confirmation of Mars' wet era, the study indicates that the planetdid not actually have an intense system of water flow. "Veryearly Mars ? and we're talking 4 to 4.3 billion years ago ? was indeed verymuch altered by liquid water both in the southern and northernhemisphere," Carter said. "But, most of the minerals we're seeing areformed on Earth in very dry environments, so this doesn't really change ourview of Mars' early environment. The mineral assemblages that we're seeingpoint to a weak hydrological system. So, there were probably small bodies ofwater like rivers, deltas and crater lakes, but we're not expecting huge oceans." Still, thestudy's findings, which are detailed in the June 25 issue of the journal Science,will help researchers understand more about the evolution of our neighboringplanet. And, said Carter, the study has important implications for the ongoingsearch for life on the red planet. "Thisshows us that the water stability era that was possibly conducive to theformation of life was widespread, so it's good news for the search forlife," Carter explained. "But, those sites that we're seeing are notas extensive or altered as a few sites that we're seeing in the south that havebeen studied for years. Several rovers that will be sent to Mars in the yearsto come will have a list of important sites on Mars that have the bestpotential for finding fossil life."